I had not been to Amparai for the whole of 2009, so I was wholly unprepared for the tremendous progress the District had registered since my previous visit in the middle of 2008, as Head of the Peace Secretariat. Then the citizens’ committees we met were still worried about security considerations, about restrictions on movement that restrained economic activity, even about the occasional massacre perpetrated by the tiny groups of Tiger guerillas who had survived the clearing of the East. By 2009, as I have noted previously, things had improved in Batticaloa and Trincomalee, so that what I heard was concerns about education and skills training for the new opportunities that were burgeoning, and about ensuring employment for locals on the development projects that were proceeding apace. It was quite clear that things were much better, and that there was confidence in a permanent peace. All this was apparent in profusion in Amparai this week, along with an abundant harvest and welcome activity in the fields I much admired in the days I traveled constantly in the District, to the concern of acquaintance in Colombo. First, back in the late eighties, there had been the British Furniture Project, which we had continued in the Amparai District for several years, when we had to cut down on work in other Districts in the North and East following the resumption of hostilities by the Tigers. Then there was a Canadian financed book production project which also involved teacher training. This had initially gone through the British Council, but when that institution decided, after its imaginative director Rex Baker had been transferred, that it was not the business of the Council to take bread from the mouths of British publishers (that was what London claimed, and the new commercially oriented director was incapable of arguing a contrary case), CIDA financed the English Association for an even larger project. This involved long stints for the training team in squalid hotels in Amparai and Moneragala and Vavuniya, with enthusiastic teachers encouraged to set up little libraries in their schools, using colourful wheeled cupboards designed by Ena de Silva. I grew to love Amparai in those days, for its landscape, its climate, its mixture of all communities. The Resthouse was run by the father of a former student, but I also stayed in the Tamil areas with a former Director of Education, and in the Muslim areas with a student who made it a point to take me to the Kattankudy Mosque where the LTTE had opened fire on people praying. I was reminded then of the intensity with which students in Jaffna insisted I visit the shell of the Public Library that had been burnt way back in 1981, an emotionality that clearly would take much time and effort to overcome. In the mid-nineties I had the GELT course, with a centre too in Tirukkovil, which was under Tiger control so that, when I asked at the checkpoint whether I could go there, the youthful sentry said I could, but he could not say whether I could return. There was also the Affiliated University College at Samanthurai, which was later absorbed into the South Eastern University at Oluvil, for both of which I advised on English programmes. But all that stopped a few years back, and in 2008 I had traveled south from Batticaloa, so I was pleasantly surprised at the fantastic road that now connected Karativu to Moneragala, through Amparai and Siyambalanduwa. I knew the coast road had also been repaired, and I was told the Pottuvil-Siyamabalanduwa stretch of the A4, which went through Lahugala, was also now completed. Journeys that had taken hours in the old days, because of potholes and checkpoints, were now a swift delight. The hotel we stayed in was much more sophisticated than anything we had known in the past. The towns in general were booming. 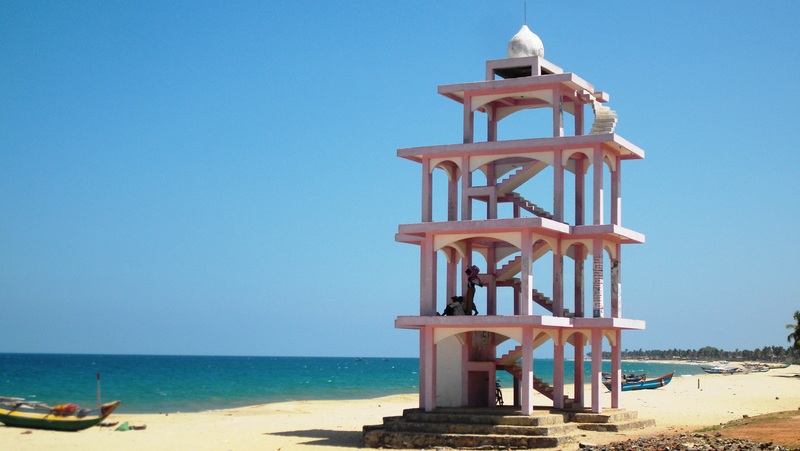 Siyambalanduwa, a hamlet in the old days, had been modernized beyond belief, while Kalmunai had been spruced up considerably. I had lunch there with a student who was exultant about the changes, with his family businesses no longer having to pay retainers to the LTTE or any other armed group. He had given me three of those fabulous Maruthamunai sarongs, and now insisted on sending a couple of shawls to my sister who for some strange reason he thought charismatic, but I felt less bad in that our party bought another fifteen items. We also bought lots of rice, which I remembered having done in the past, but then it was a nuisance because of the checkpoints we had to go through. In the midst of all this prosperity however, with dividends of peace so apparent, there still remains much to do. I noticed some election posters which stressed sectarian identity, which seemed a mistake. Amparai is an area in which each of the major parties should ensure multi-ethnic representation and, even if this is difficult under the current electoral system, they should not encourage candidates who highlight differences. At the same time we must recognize that our social systems still stress differences. I remember a couple of years back, when I first took over the Peace Secretariat, being told that the distinctions the education system highlighted, with Sinhalese and Tamil and Muslim children being compartmentalized in different schools, was particularly worrying in Amparai. I saw something of this in the English project I was helping to inspect, with Tamil and Muslim students in different classes in contiguous areas. Surely we could set up at least a couple of schools, centres of excellence, in which children of different communities could learn together, perhaps even doing a couple of subjects in English so they could be in the same class on occasion. The thirst for English was apparent, with one elegant International School, and some of the bigger schools having continued bravely with some English medium classes despite teacher shortages. This should be encouraged, because the economic opportunities the East has to offer will benefit the people of the area more if they can function in English too. Tourism and trade and even vocational skills that can be used abroad need English, and it would be a pity if proficiency depended on the commitment of just a few principals, rather than being extended as broadly as possible. The Government Agent meanwhile has done a fantastic job in promoting common cultural programmes, and in endeavouring to bring together his public servants who, in the divisive Ceasefire Agreement days, were of the view that the District was in fact two Districts, one Sinhala speaking and the other Tamil speaking. That division was exacerbated further, with the understandable determination of the Muslims, in the days when the LTTE held sway, not to become a mere appendage to Tiger nationalism. Some of this divisiveness continues, in what seem hospitals for different ethnic groups, though fortunately the training our doctors receive encourages them to work together rather than in separation. Clearly however the time is ripe now for a more integrated approach than was ever possible in the past. The opportunities that have been opened up by the extraordinarily efficient work in the last couple of years of the Eastern Reawakening Programme need commensurate levels of Human Resource Development. A concerted programme that brings all communities together for this purpose will facilitate Amparai being the flagship in this respect that its fortunate ethnic composition can promote.